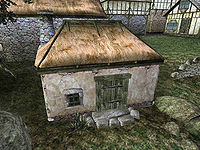 Adanja's House is a small, out-of-the-way house on the south side of Pelagiad that contains very little of interest. It is inhabited only by Adanja, a Khajiit woman. The only items of potential interest other than some assorted ingredients are two chapters from the Poison Song series, on the bed in the basement. Neither of the doors are locked, so you can enter freely, and Adanja won't see you if you steal things from the lower floor.